There are many challenges faced by newspaper companies to gain competitive advantage over the internet and increasing digital media consumption. How do newspaper companies face these challenges? How can they refine and strategize their business model to remain competitive? What are the issues that newspaper industries face? With all these questions, this chapter discusses key areas and conceptual models of future newspapers’ strategy framework and supply chain management through literature review and analysis of technologies and innovations. The development of internet has affected the way in which most business work. Among these activities, newspaper industry across the world is undergoing significant changes. There has been a decline in the printed editions of newspapers, replaced by digital versions. Furthermore, market research has indicated that reduction in advertising revenues of newspapers have significantly declined due to the switch of advertising from printed newspapers to Internet. These changes have prompted suggestions that there will be necessarily major changes to newspaper supply chains (Currah, 2009; Economist, 2006, pp. 57-59). For instance, a rapid decline in reader numbers has been observed in regional newspapers: sales of UK regional newspapers declined from 2.1 billion in 2000 to 1.7 billion in 2005. This decline is predicted to continue so that, by 2010, sales will have fallen to 1.4 billion copies (Graham and Smart, 2010). Many newspapers are losing their market share and disappearing, while others are moving almost inevitably to online and digital formats. 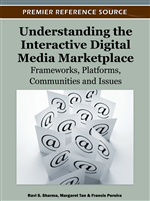 However, it has been difficult to find ways of profiting from the digital ventures (Ihlström & Henfridsson, 2005), which creates several issues during the transformation of newspapers industry. Digitalization has indeed created new consumption habits. Today, younger people essentially consume news in a steady stream of information bites (Elizabeth, 2009). Breakthrough innovations of internet technology have allowed new channels of information sharing through social networks. People are now constantly connected to internet through computers and mobile devices which allow them to gain multiple digital resources at the same time. With the transformation of newspapers industry and increasing online and digital consumption, challenges are also raised for newspaper companies to refine their business strategies and supply chain management to re-gain value proposition. What are the major Internet technologies and their roles to influence users’ consumption of information? What are the fundamental disruptive issues in the newspaper industry? How do we refine the business model in the future of newspapers? How do we define a new model of supply chain management of newspapers industry under the impact of Internet technology? With these questions in mind, the key areas are reviewed and conceptual models of future newspapers’ strategy framework and supply chain management are proposed with future research recommendations. Emerging new technologies followed by demand from early adopter prompted the press industries to create online or digital version of printed newspapers. Newspaper, being the source of information for news and articles, have been around for ages, has now been challenged by services invented with new technologies. In this section, we will review the current technologies' impact and different types of innovations they have brought to the newspapers industry. The review of technology and networked information economy and sustaining innovation vs. disruptive innovation addresses our first and second question in the paper.